Are you trying to save a little money when it comes to servicing your car in Wilmington? 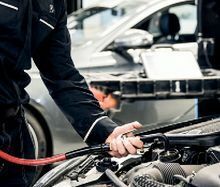 Take a look at these great car service and maintenance specials. Keep your car and wallet happy at the same time! Just print one off and bring it in today! All fluid level check and corrections are dependent on factory-recommended service intervals for your vehicle's year and model. Price advertised for Service A/B includes all factory-required components for model years MY09 and newer. Please refer to your maintenance booklets for the complete list of factory-required services and details on the specific intervals for your vehicle's year and model. One-time use only. Must present at time of purchase to receive offer. Cannot be combined with other offers. Not valid on previous purchase. Cannot be combined with any other coupons, offers or specials. See Service Advisor for complete details. Mercedes-Benz vehicles only. Present this coupon to receive 10% off wiper blades with professional installation. Restrictions apply. Call Wilmington Mercedes-Benz for complete details. Offer only valid on select OEM, OEA tires. Tires must installed by dealer to quilify. Excludes previous purchases. Only eligible on Mercedes-Benz vehicles. No cash value. Void where prohibited by law.